Today, I’ll work on a filling stitch called Seed Stitch. There are several stitches which can be created based on these straight stitches. For example, Basket stitch, Diamond eyelet stitch, Fern stitch, Arrowhead stitch, Seed stitch, Algerian eye stitch etc. With the combinations of several straight stitches; running stitch, darning stitch, holbein stitch- all these can be created. In straight stitch, the thread is not looped or twisted. It remains straight. Seed stitches are all about taking random straight stitches. These are used to mainly give a filling effect to leaf or fruit outlines. 1. Pull the threaded needle up from some point of the fabric. Better to start from the edge. 2. Leave some space and poke the needle back to another point behind the previous point. 3. Pull the needle up through the fabric in front or close to the previous points. But do not maintain any certain pattern like back stitches. Do random stitches. There is another stitch called seeding stitch. I saw it in Kate Haxell’s book. 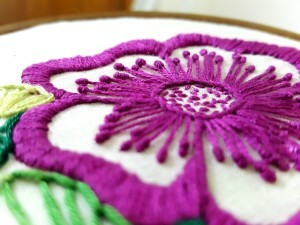 Unlike the seed stitch, it has a certain pattern to be embroidered. The stitches are not random. I’ll be working on it sometime.